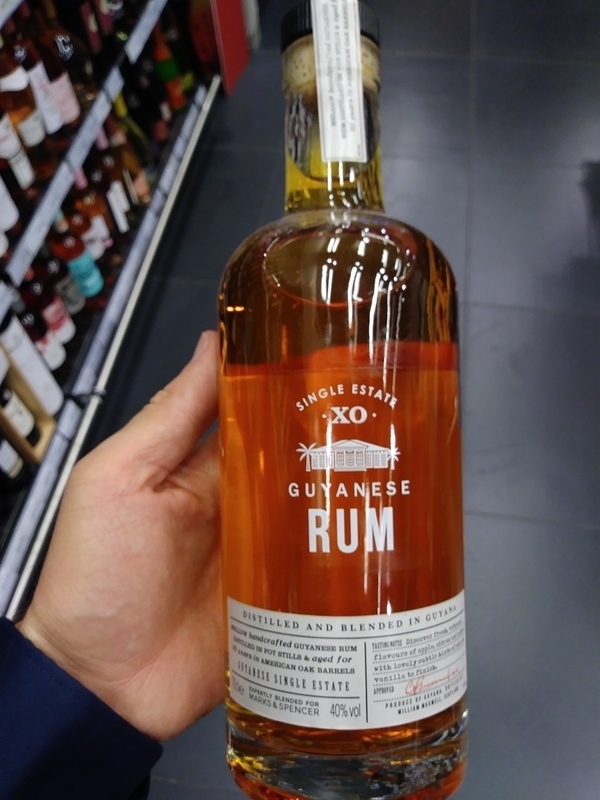 Have you found an online vendor selling Marks & Spencer Guyanese Single Estate XO? M&S I think tend to get their rums from Plantation, and this states that it is a pot still rum aged for 10 years in American Oak. Interestingly, M&S list the ingredients on their rums, and it has always been a bone of contention with me that they call the sugar that they add to their rums "cane sugar" as if it somehow sounds more natural. Rum is made from sugar cane, so what harm can adding sugar from cane do?? Well that's what I presume. However, this one, the ingredients are Rum, demineralised water and plain caramel (colour). ie NO SUGAR has been added (supposedly). Certainly it is a lot drier than the Bajan rum they sell (a Plantation one). Still, the nose is a tad confected and if I am honest, it is a little disappointing. I was half expecting a full vanilla oak nose like Cruzan Single Barrel has, not least as M&S tend to err towards a sweet, big and obvious style. The tasting note mentions apples, and yes, when I say confected, it is like a candy apple nose. But it is restrained and not OTT. A certain elegance is retained. The palate though is where I find it much more interesting. Again there are notes of apple, but there is a wonderful acidity to it that gives a fine dryness. It won't be to everyone's taste, but for me, it is a good rum to have in the cupboard to turn to for its dryness. While this has been in American oak for 10 years, I get Cognac. Maybe that is my presumption that it is a Ch Ferrand rum, but only Bache-Gabrielsen supposedly age their cognacs in American oak. Its well priced for what it is. If I had not read up on this rum I would be convinced it was a mix of a plantation and Dominican Republic rum .. it's so dry it's amazing, not on the level of xamaca by plantation but delightful. 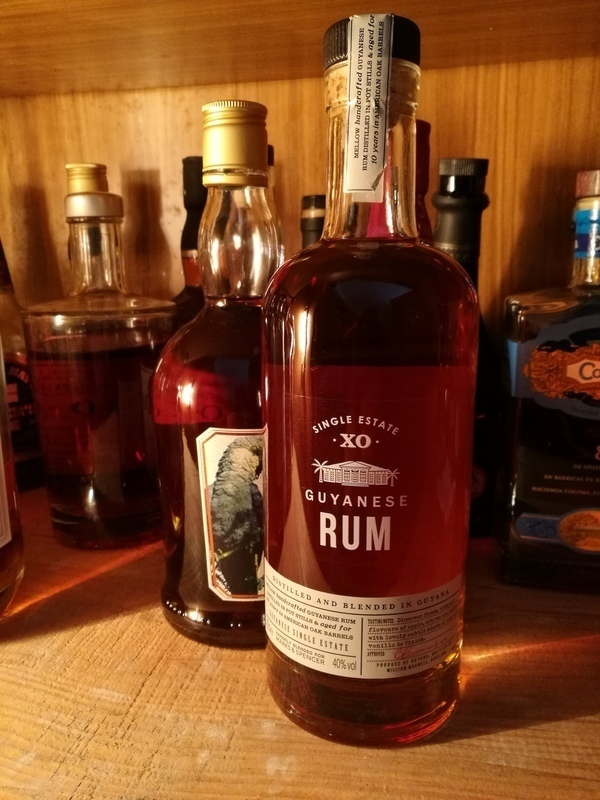 Enjoyed a bottle of Marks & Spencer Guyanese Single Estate XO Rum while vacationing in Malta. Very nice and fresh bottle and label design. Light brown color, darker than golden. Reasonably priced at EUR 35 a bottle. My very first experience with Marks & Spencer distributed rum. Very dry, plenty of woodiness and a hint of vanilla to both nose and palate. Mild burn at the end. Fine dry rum from Marks & Spencer. I did not excpet big performace from this one, but it was pleasant surprise. Taste is dominated by Oak character with hints of vanilla. Bought this yesterday in M&S Bury St Edmunds. Well having tasted it it's similar to El Dorado 8yr old but not nearly as complex as the ED 12yr old (which was just awarded the Gold medal for Best Rum in the first Caribbean Rum Awards) but still has that lovely demerara sweet notes. Not as long lasting in the finish as i would have liked but at £25 online a bottle still good value. Perfectly suited for mixing for a nice top quality 'Freddie G' but able to stand up on it's own as a sipping rum, even if it is a little bit rustic and not as smooth as the 12yr old (remember the 12yr old bottle will have rums with a Minimum age of 12yrs going up to 14yrs when the next level comes in at the 15yr old bottle - and my favourite). 6.5 stars out of 10. But gave 7 for this rating as no 1/2pt option.